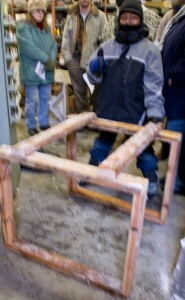 Marcus McConnell views the completed box frame at the Buffalo ReUse demonstration. You can start seeds anywhere– even in your basement– by building an inexpensive frame that holds a light. At a well attended workshop Saturday at Buffalo ReUse, Danielle Rovillo, ReUse’s community programs director, and Tom Arrigo, volunteer, gave a demonstration on how to build frames using recycled materials. 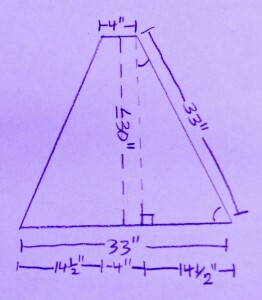 The directions for building two different styles, an A-frame and a box frame, are given below. The A-frame is designed to hold one light and the box frame holds two. You don’t necessarily need a frame to hold your light, Rovillo said. She sets seedling trays on tote bins and hangs a light from underneath her desk (which is made of a door). Other people hang lights from shelves in bookcases. A frame, however, allows you to hang a light without drilling holes in your furniture. The light itself can be a simple shop light, and Buffalo ReUse often has shop lights in stock. To get a full spectrum of light for your seedlings, Arrigo suggests using one “warm” white bulb, which emits light that is more red and orange, along with one “cool” white bulb, whose light is more green. Of course, you can also buy a light specially designed for growing plants. Once the seeds have sprouted, you’ll want to run the light for more than 12 hours a day, Arrigo said. The seedlings need intense light to help them grow stout with lots of leaves, he explained. If the light is too weak or too far away, the plants will produce more stem in order to try to reach the light. That makes the plants leggy and weak. As the seedlings grow, you must move the light farther away. The frames described below allow you to adjust the chain that holds the light. The closer the light is to the table, the less the light will radiate out, he added. You will need to rotate your trays of seedlings to make sure they all get exposed to the light. If you start your seedlings in a cold place, such as your basement, you’ll need to keep the plants warm. Rovillo noted that her grandmother used blankets to keep the heat in. Today, reflective material and heating mats are also available. 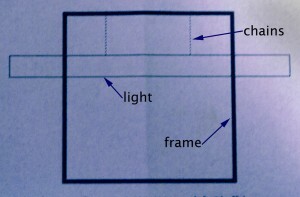 The instructions below are for frames to fit a typical card table. Three seed trays will fit under either the box frame or A-frame. 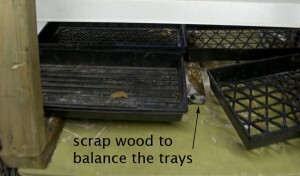 If you set a scrap piece of wood in the middle of the table to balance the trays, you can fit four trays. Rovillo estimates that the wood for the A-frame costs less than $5 at Buffalo ReUse. You may need to purchase some items for the project at a hardware store. Fasten bottom brace to angled side pieces with 2 screws. 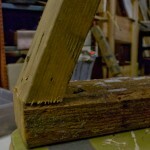 Fasten top brace to fully assembled sides. Drill two holes into top brace at spots the same distance from each end. 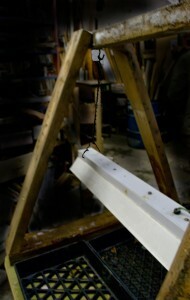 Insert hooks using one washer on either side of wood. Tighten. Hang the light from the chain. Cut lumber into 6 pieces, each 33 inches long. Also cut 4 pieces, each 24 inches long. Fasten top braces (perpendicular) to side pieces with 2 screws, each about 6-8 inches from the end. Drill 2 holes into top brace at spots the same distance from each end.